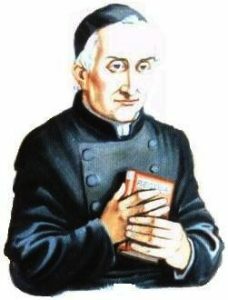 By that stage in our formation, the person and writings of our eventually sainted Founder, St. Gaspar Bertoni, were such a part of our daily lives as we prepared for these great and challenging steps along the way toward the Stigmatine Priesthood. We came to understand that St. Gaspar Bertoni was much inspired to imitate/ follow Jesus Christ in his own particular manner, as “Apostolic Missionary” responding to the portrait of the Risen Christ: We must make in ourselves a portrait of Jesus Christ. [His Diary, Feb. 26, 1809]. In Jn 20: Jesus showed His Apostles His wounded hands and His side, saying: As the Father sent Me, now I send you! – and his hope was that this dream would also be handed on to other later generations of Stigmatines. It seems that already before his death, St. Gaspar hoped that the Stigmatines would become “international’ as he said in his Original Constitutions: that we should be ready to go “anywhere’ in the Diocese or the World. St. Gaspar chose a sublime “way of living”, a truly committed modus vivendi, by choosing St. Ignatius of Loyola, as his “Model’ about which he wrote: For the examination of conscience one should choose a Saint of the same vocation as a mirror…[July 30, 1808]. St. Paul had already taught us that Jesus Christ was the ICON [the image] of the Living God [cf. Col 1:15]! St. Paul’s challenge was also: put on the mind of Christ Jesus! [cf. Ph 2:5, ff.]. This is what St. Ignatius did, and St. Gaspar followed suit and tried to do the same in his own life. As we remember from our recent celebration of our second Stigmatine centenary, St. Gaspar entered the House called the Stimmate [named for the Stigmata of St. Francis] in Verona on November 4, 1816 – and died there on June 12, 1853, after nearly 53 years as a priest. As his health declined, in the 1840’s, he was inspired to put together some kind of a rule of life to be observed as he approached his own death. While he lived, the first Stigmatines looked upon him as the “Living Rule”. 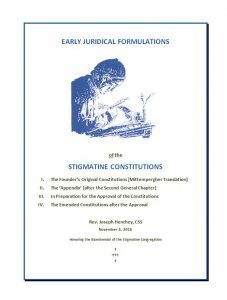 In the mind of the Church, a book of “Constitutions” approved by the Church, is intended to keep this blessed manner of living alive – even though it would need periodic updating with the passing of the years. In this month’s reflection, we will offer the first four “Codes” of St. Gaspar’s Way of Life: His Original Constitutions [1840, and the years following, after living the community life for a quarter of a century]. – an eventual Appendix to Part XII to St. Gaspar’s original code – a juridical addition, requested by the Holy See for the initial approval of the community; a manuscript of 1889, prepared for printing as the Congregation sought its definitive canonical approval – which came in 1890; and finally, another Code [with corrections, omissions] offered following the results of the General Chapters of those years and the required observations from the Holy See in 1890– four booklets in all. In his Summa, St. Thomas Aquinas dedicated some 25 of his lengthy Questions to the matter of “Law”. Jesus Christ “translated” His Father’s Will/Word in His Incarnation. With His Resurrection/ Ascension, the Lord left this challenge to His Church – some of her members were inspired by the Spirit to communicate Christ’s revealed message in the spoken and written Word. Through the centuries, great men and women were called to further the Kingdom of God – which had its own “Constitutions” in the Commandments, Beatitudes and Counsels. Each of these great individuals left their mark on the pages of the history of the Church, and her holiness. The ideal was committed to the human word, which constantly needed further fathoming, and a deeper understanding. To help in this process, Laws and various codices came to gather with some practical insight into the great Mystery of God and His Plan. As. St. Thomas noted [cf. A. I. Menessier, OP, Pattern For A Christian According To St. Thomas Aquinas, pp. 47, ff.] fundamental requirements ask for contemplative reflection, updating, editing. The Law of a religious community – its fundamental Law – after the divine revelation, is the Teaching of the Church and her special Witnesses. To be valid, this Law needs to look out for the betterment of the whole. Obedience to the Law of God is to live His will. As Moses’ presented a Law written on stone Exodus], Jeremiah [31:31, ff.] speaks of a New Covenant of God’s Mercy written on the hearts of human beings. These attempts needed progressive education, and on-going enrichment by the understanding and the living of those Laws that lead to God. Each human existence has divine meaning. Faith is first and in every way, in the Revelation that God makes of Himself – through the centuries this is more deeply grasped to live by the understanding that comes through Contemplation, Study, Magisterium and Lived Experience [DV 8]. As the divine word was incarnate in human flesh – to redeem the world and to make known the plan of God, the celebration of the Incarnation is observed as “Christmas”. The three Masses were thought of as the eternal birth of Christ from the bosom of the Father – the Mass at Dawn as the birth from the Blessed Virgin Mary – and the birth of us all through the grace of God in our lives offered to us through Mercy. During the three [Christmas] Masses: recollection and an experience of the great benefit of [my] vocation. What a great blessing it is to become oblivious and stripped of all created things. To seek only God. How much did God honor and love His humiliated Son. Oh, what a responsibility do we have to do for Him, partly at least, what He firstly did for us. [December 25, 1808]. As Christmas approaches, along with the great mysteries of Jesus’ Eternal Birth from all eternity – His birth from the Blessed Virgin Mary, Spouse of Joseph – let us pray over the Mass during the Day, asking God to deepen His Sons birth in our hearts and minds. A blessed Thanksgiving, Christmas and New Year! Let us continue to pray for each other! With much hope in God’s Mercy and with the intercession of our Holy Patrons, the Spouses Mary and Joseph, may blessings come to us all in this happy season!